Juggle is about freeing you to do the things you want to do. It's also about helping you juggle with excellence the things you have to do. 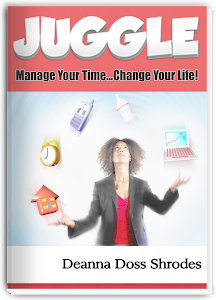 Within Juggle's pages you will discover keys to juggling your roles and responsibilities well, and living the good life you long to live. Along the way you'll also find rest for your weary soul and lots of encouragement that you can do this. Principle #1 What Tops Your List? Don’t have a Kindle? No problem. You can read the book on any computer or mobile device.